Here are just some of the parts companies around the world are printing. Gone are the days when 3D printers were just for hobbyists or multi-million-dollar companies. 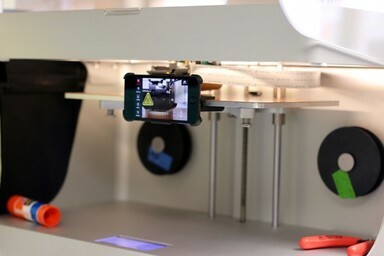 From 3D printed robot grippers to 3D printed TV and movie props, here are just some of the inventive parts being printed on Markforged printers. Sweden-based company Alfdex manufactures crankcase gas separators for the automotive industry. The company printed grippers in PLA/ABS, but found they wore out after only 40 hours of use. Instead of spending 150,000 SEK ($16,659 USD) to get grippers produced in aluminum, they contracted the Swedish Markforged partner 3DVerkstan Nordic AB to get a carbon fiber reinforced gripper printed. Daniel Nilsson, production engineer at Alfdex, says the robot cell they are testing with the Markforged 3D printed grippers accounts for “25 percent of deliveries to a major Swedish car manufacturer.” They now print grippers for 1,400 SEK (155 USD), and they have now equipped two of their robot cells with grippers printed on the Markforged X7. 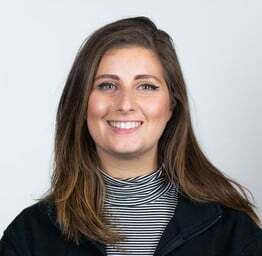 Neurosciences PhD student Sage Aronson runs Neurophotometrics in California. They make a device allows people to record brain activity using a mix of optical tools and fiber optic cables. Sage has made a number of changes to the device over the years to upgrade its sensitivity, its user friendliness, and reduce its cost. His long-term goal is to completely disrupt the scientific hardware industry, which he’s already starting to achieve. Sage bought six Onyx Ones from Markforged, and has them running almost 24/7. “We use it for prototyping. We use it for the end use products, and it just wouldn't have been possible with traditional methods,” says Sage. The printers are used to fabricate tools and fixtures, though 95% of the usage is printing end use parts such as the optical housing. The University of Technology Sydney (UTS) has competed in the Formula SAE Australasia (FSAE-A) competition since 1999. Currently comprising of 25 students studying at UTS, the team has to find inventive ways to improve upon their previous designs. In the past, the students had done fairly well (placing 2nd in Endurance, Autocross, and Design, and 1st in Efficiency for the EV class in 2017). 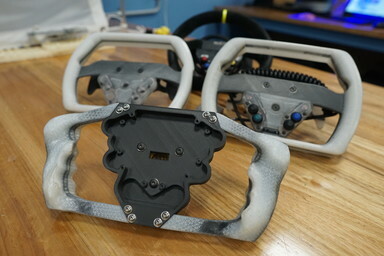 For the December 2018 race, the team decided to utilize the Markforged X7s located in the university’s Protospace to create a new type of steering wheel. Starting with clay moulds to form hand prints for each driver, they scanned the clay, converted the image to an STL file, and printed custom grippers that they could easily bolt and unbolt from the steering wheel. This means each student driver will bring individual steering wheels to avoid hand fatigue during the race, while also reducing the weight and increasing the strength of the steering wheel. The team used continuous fiber reinforced Nylon for the grippers and continuous carbon fiber for the body. Legacy Effects in California produces special effects and props for TV and movies. The props must be light enough for actors to use for hours on end, and need to survive the usual wear and tear they usually undergo on a film set. 3D Print Engineer Dean Schneider was brought in to run the 3D Printing Department of the business after the company realized that traditional manufacturing couldn’t always be the solution for one-off designs. 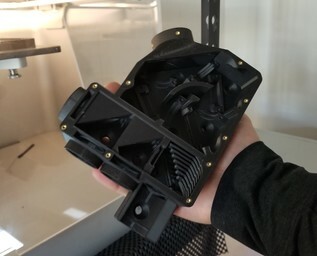 Once he tested the strength of Markforged sample parts, he decided to add a Markforged Onyx Pro printer to his shop to provide the company with strong, lightweight props. Humanetics is the world’s leading manufacturer of crash test dummies for the automotive industry. 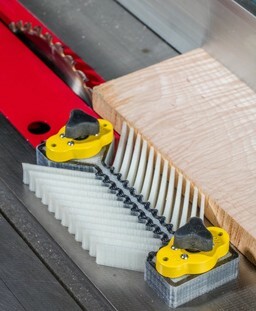 The team ran into an issue with its molds: they weren’t able to withstand the day-to-day abrasive environments, and were wearing down too quickly. Humanetics engineer Kris Sullenberger initially thought he would have to choose between continuing to make cheap silicone molds, or sending out aluminum molds at a high cost to the company. Kris found Markforged and started to create neck ring molds for the dummies. After proving out the technology and creating a successful neck ring mold, the team started to look for other parts of the dummy to replace with 3D printed material. 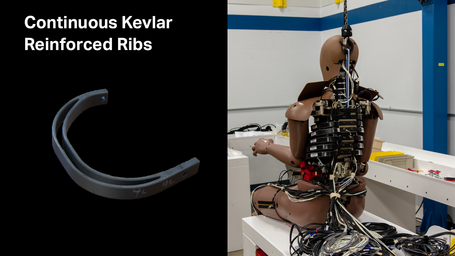 The dummy’s ribs were initially made from steel, and were then made from ABS/PLA material. However, after about 20 or so hits, the ribs started to crack. This led Kris to turn back to its Markforged X7 to print the Kevlar-reinforced ribs, which were able to endure over 150 impacts without cracking. ‍Test the strength of our material by requesting a free sample part today! The value of 3D printed parts may not be directly apparent, but inside the chassis of MIT's Formula SAE electric vehicle are many critical Markforged parts.